I noticed today in Hotmail, on right-hand side a new window titled “Quick Add”. 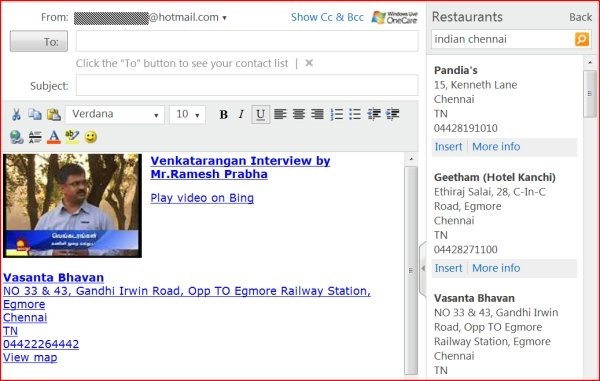 This seems to allow you to insert Image & Video search results from Bing directly into your outgoing Hotmail messages. Apart from images, videos, you can also insert results of Movie times, Maps, Restaurants and Business Listings. Though the Maps, Movie Times & Business Listings didn’t work for me (may be India is not yet fully supported), I found Restaurant listings and video inserts to be working well and quite useful in everyday usage. As for availability, I read in Live wire blog that Microsoft has only rolled out the new tool to Australia, Canada, China, India, the US and the UK so far.